As Illinois Great Rivers Conference launches a new mission partnership with the United Methodist Church of Honduras, seven members from throughout IGRC arrived in Honduras on Aug. 18. This is the first of future IGRC mission teams to Honduras. Those on the trip were Madonna Foster (Carrollton UMC), Gregory Gelzinnis (Alton Main Street UMC), Sharon Hicks (Stronghurst UMC), Bryan Lambdin (Springfield Douglas Ave UMC), Donna Schaad (Bloomington Wesley UMC), Ann Wagle (Danville St. James UMC) and Bunny Wolfe (IGRC Missions/Outreach Coordinator). The IGRC mission team pioneered two new areas. We were the first team to stay at a newly rented space for work teams and we were the first group to work in Tegucigalpa at the site of a newly planned building in the area of La Colonia Maya. Our team worked at the site each day helping to build the retaining wall which is the first phase of the project before ground work and building construction may start. We filled in a trench, built benches, carried rocks and cement, shoveled sand and cement, pushed wheel barrels of sand and rock, conducted VBS and became acquainted with members of the San Jose de le Vega UMC and our fellow workers on site. This project will take a minimum of three years to complete and it will take the help of many other mission teams working at the same site. The proposed building will be the new San Jose de la Vega United Methodist Church with a sanctuary that will hold 150 people. In addition to the sanctuary, the building will be the parsonage, a training center and the mission office for the United Methodist Church of Honduras. 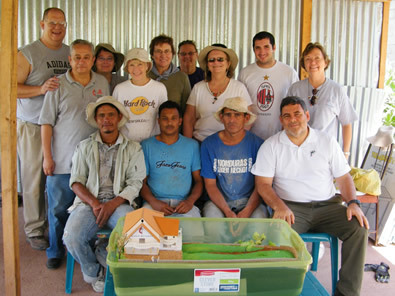 IGRC and members of the San Jose de la Vega UMC jointly held a vacation Bible school our last three afternoons on site. Children of the San Jose de la Vega UMC were transported to the site and children from the new neighborhood attended. To follow up contacts with area families who participated in the VBS and to help establish new members before the project is completed, weekly services will soon begin on site in a temporary shelter. The youngest “helper” of the work team who joined us every day was little three-year-old Juan David who seemed to roam at will and lived just below the construction site. Sometimes he tried to push an empty wheel barrel or tried to shovel sand with a shovel three times his size, but he was always there. Often he was riding in the empty wheel barrel after large rocks were delivered for the retaining wall. What a blessing to see this child come to VBS, but most of all to see a positive change in his interaction with other children along with his acceptance of us by the end of the week. He didn’t want to see the other children leave the last day of VBS. As I witnessed him waving good bye to the children leaving the last day of VBS and saw for the first time that week a big smile on his face, I prayed that good seeds were planted within his heart and soul during the limited amount of time we had with him. I prayed for the three Honduran men who are stay at a temporary shelter on the worksite and have become substitute fathers and role models for him. We each came away from Honduras with Juan David and his home situation heavy upon our hearts. We will continue to pray for God’s provision, protection and providence in this child’s life. I am truly thankful the United Methodist Church will be there for Juan David, his family as well as many others in this neighborhood in need of Christ. The next IGRC Honduras Mission Team is already scheduled for June 2013. A brochure and information is available by contacting bwolfe@igrc.org. Please consider becoming a part of this new IGRC mission connection. Additional teams will be planned as members of IGRC answer God’s call this new IGRC mission partnership.